She was born on the 6th January, 1972. She is from Lokoja Local Government Area of Kogi State. She attended the following Schools: Baptist Local School Management Board (1977-1983); Kwara State Polytechnic Secondary, Ilorin, Kwara State (1983-1988); University of Ilorin (B.Agric); Postgraduate in Education (PGDE) University of Ilorin and Nigeria Institute of Science Laboratory Technology (NISLT). She is a member National Association of Academic Technologist (NAAT) University of Ilorin Chapter. 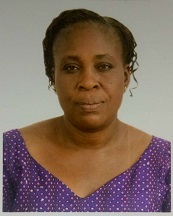 She joined University of Ilorin Department of Aquaculture and Fisheries on the 5th January, 2015. She is currently a Technologist in the Department.